Chances are that nearly every device you rely on daily in your life charges from USB. Phone, tablet, smartwatch, fitness bands, cameras, and GPS units. So why don’t we have these built into our power points yet ? Well, the great news is they are here. 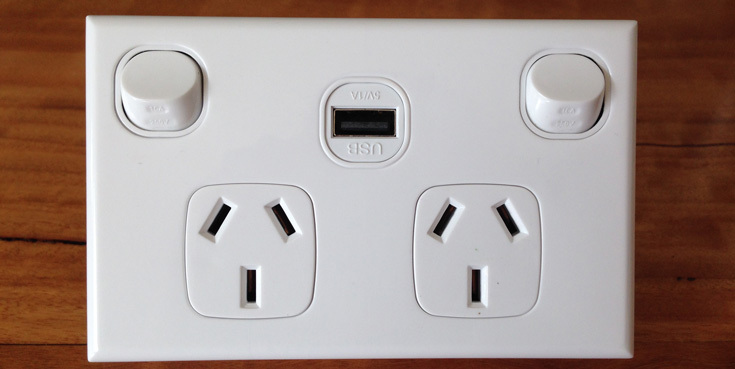 Power points are now available with single or double USB ports on them. They are available in several different brands , colours, and finishes. Single or double power outlets are suitable for the office, warehouse or factory. Forget bulky adaptors, plug in all your gadgets. No need to clutter up your power points with battery chargers anymore. They come in a standard wall plate size and can directly replace an existing power point. They need to be installed by a licensed electrician as they have to be hard wired, thanks to a level of overload protection which is there to stop devices from getting damaged from an overload in electricity.